Departement of the Alpes de Haute Provence - Pop. : 211 inh. - Altitude : 1,470m. 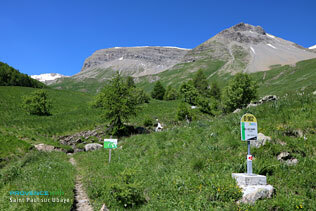 From Barcelonnette (21km) by the D900 then the D 902 (route des Grandes Alpes), or from Cuneo in Italy (18 km from the Italian border). 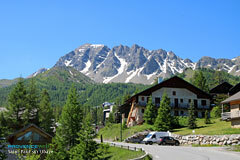 Saint Paul sur Ubaye is a small village that stands out on its promontory against a backdrop of breathtaking rocky jagged peaks, on the road to the Vars pass, known as the "Route des grandes Alpes". 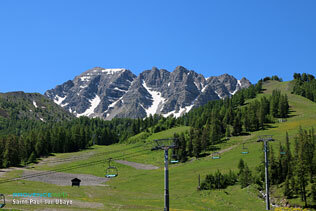 It is well known to mountaineers and is a starting point for many climbs. 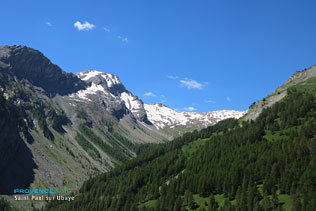 It is well known to mountaineers and is a starting point for many climbs. 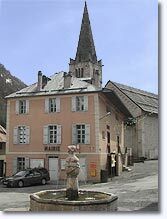 St Paul sur Ubaye is the highest municipality in the Alpes de Haute Provence and the only one to have 34 peaks over 3,000 metres, such as the Brec du Chambeyron (3,390 m), the Aiguilles du Chambeyron (3,412 m) or Brec du Rubren (3,340 m). Not forgetting several renowned climbing sites (Pont voûté, Aiguille Pierre André and Aiguille Large). 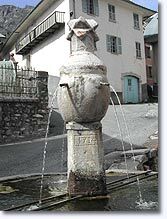 Saint Paul sur Ubaye is also a friendly little village, with its craftsmen (a maker of wooden toys, a potter-ceramicist, etc. ), its gîtes and inns with their flower-filled terraces and its pretty fountain (dated 1714!). It also has an old wash house and large well-spaced houses that are brightened up from time to time by a wooden balcony. Even if you are not a hiking enthusiast, the music of the torrent at the foot of the village and the absolute purity of the air will be enough to pep you up! When in the area, be sure to see the impressive Chatelet bridge built in 1882 on a sheer rock face, 110 metres above a thundering river, which you can admire from a specially built platform. From the side of the (narrow!) 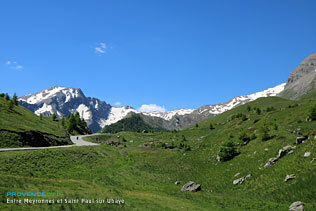 Maljasset road, contemplate the vivid renovated fresco on the façade of the tiny chapel of St Antoine. Finally, on the way down the Vars pass road, stop off at the Berwick Redoubt, a massive stone citadel, even if it is not open to the public. It is the only one remaining of the seven strongholds built by Vauban. Left unused for two centuries, it was part of the Ubaye valley's defence system in the 20th century, at which time it housed a garrison of 50 men, two warehouses and a powder magazine. Albert Manuel Museum of the Valley (Tools, work, traditions). Châtelet bridge (listed as a historic monument). 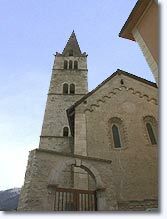 St Antoine de Maurin church (12th century, listed as a historic monument). St Thomas de Tournoux church. The Hamlets of Serennes, Fouillouse, Saint Antoine, Maurin, Maljasset, and their sundials. The former green marble quarry (Maurin). The Berwick Redoubt. Tournoux Fort. In winter, there are 17 km of cross-country ski runs, from one wooden bridge to another. 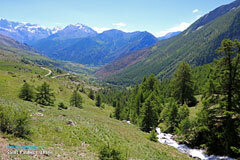 In summer, numerous walking trails. Mountain biking, bicycle touring. Climbing, Tennis. Living Museum Day (in August). Bread Festivals. Craft fair (13th August). 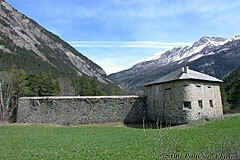 Gite for hikers, 1 refuge, 1 gite, 2 municipal gites. 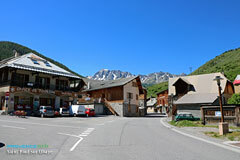 La Condamine-Châtelard (9 km), Meyronnes (13 km) and Maljasset (14km).